Both the American and Turkish air forces halted their strikes on Syrian territory around the time Russia deployed S-400 air defense complexes at the Khmeimim airbase, from which it stages its own incursions against Islamic State (IS, formerly ISIS/ISIL). A spokesperson of the Combined Joint Task Force Operation Inherent Resolve (CJTF-OIR) told Sputnik on Friday that the absence of anti-IS coalition airstrikes “has nothing to do with the S400 deployment” in Syria. “The fluctuation or absence of strikes in Syria reflects the ebb and flow of battle,” the spokesperson said, adding that CJTF-OIR deliver airstrikes when and where it needs to, dedicating a lot of time to researching targets to ensure maximum effect and minimizing civilian casualties. As CJTF-OIR reported on Friday, the US-led coalition had made no sorties against targets in Syria bsince Thursday, while airstrikes against Islamic State in Iraq continued, with the coalition making 18 strikes on terrorist positions. S-400 Triumph system missile launchers were airlifted to Syria by Antonov An-124 Ruslan super-jumbo aircraft 24 hours after the decision was announced on Wednesday. 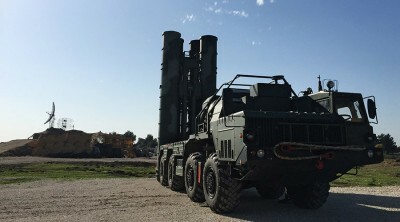 According to open sources, the S-400 is capable of shooting down any existing aircraft, helicopter or missile traveling at speeds of up to 4.8 kilometer per second (over 17,000 km/h) The only target the system would have problems with is a nuclear warhead of intercontinental ballistic missile, which flies at speeds of up to 6-7 kilometer per second. The S-400 engages targets at distances as far as 400 kilometers and heights of up to 27 kilometers (or higher with newer missiles). This is enough to cover at least 75 percent of Syrian territory, along with the airspaces of Lebanon, Cyprus, half of Israel and a vast part of Turkey.